Photo: Construction on the Keystone Pipeline began in 2008. Many people remain under the assumption that the “Keystone XL” was nothing more than a proposal on paper that, thanks to the campaigning by the non-profit industrial complex (led by 350.org), a proposal that never materialized. This is not surprising as the campaign was deliberately framed this way. The entire Keystone Pipeline System (with the exception of the much hyped phase four which constitutes 526 km/ 327 mi of pipeline) has been built and in operation, the first phase having gone into operation back in 2010. Phase 1 (3,456 km/ 2,147 mi) went online in June 2010. Phase 2 (468 km/ 291 mi) went online in February 2011. Phase 3a (700 km/ 435 miles) went online in January 2014. 76 km (47 mi) of additional pipeline will come online in 2016 which will then complete the project. The Dakota Access is the clone for KXL for carrying oil obtained from the North Dakota Bakken oil/fracking boom (a ecological and social nightmare ignored by the non-profit industrial complex) – but on steroids. What is not understood by most is how paramount Dakota Access (what Steve Horn calls the Keystone XL clone) is in terms of both investment and industry. The Dakota Access makes Phase 4 (the northern leg) of Keystone XL completely insignificant, if not irrelevant, a Trojan Horse if you will. The Dakota Access is the clone for KXL for carrying oil obtained from the North Dakota Bakken oil/fracking boom (an ecological and social nightmare ignored by the non-profit industrial complex) – but on steroids. The pipeline the Dakota Access connects to is located on the MHA Nation (apparently originating from an oil rail transloading facility). The Keystone clone is the combination of the Dakota Access pipeline and what it connects to: East Gulf Access Pipeline and then Enbridge’s entire system. Although Horn refers to this as the Keystone XL clone, it’s the Keystone Pipeline System on crack in terms of how much oil it’s bringing down to the Gulf: Dakota Access carries up to 7x more Bakken oil than the Bakken Marketlink on-ramp would have for KXL North (up to 750,000 barrels per day verses 100,000 barrels per day). 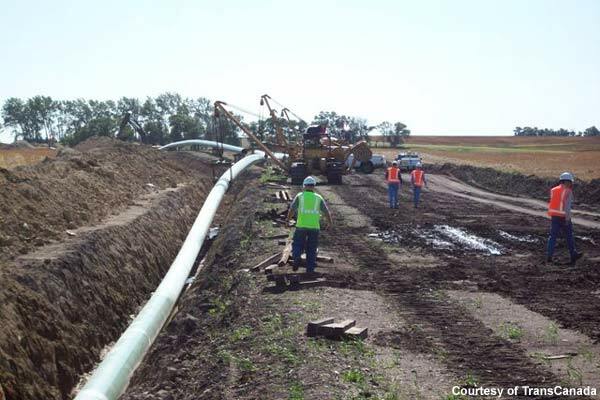 The Dakota Access connects with the East Gulf Access Pipeline in Patoka, Illinois. That’s the Bakken part of the “clone.” Enbridge’s system is the tar sands portion of it. The only phase/section of the Keystone Pipeline System that was cancelled was the phase 4 section. So in summary, in actuality, the entire pipeline has been built and put into operation with the exception of 526 km (327 mi) of pipeline with the next section coming online next year. This section (Phase 3b, 76 km/ 47 mi), the Houston Lateral pipeline, which redirects a large swatch of that tar sands oil over to the Houston Ship Channel and the markets it serves, is never discussed except for in investor calls and writings by Horn and a handful of others. No word yet from the media (of any kind) or the non-profit industrial complex about Warren Buffett’s 21st century rail empire built while all eyes were on Keystone XL. Crude via rail bomb trains have resulted in the deaths of 47 people (including children) in Lac Megantic, Quebec, Canada and the deaths of two others in a separate crude via rail derailment. These deaths are on top of massive ecological devastation from crude via rail derailments that continue to this day , the most recent derailments occurring on November 5th and 8th of 2015.